Habib El-Adly, interior minister under autocrat Hosni Mubarak, has maintained that the 2011 uprising was a "conspiracy" rather than a popular revolt as he continued to testify in his own defence on Wednesday. The court was set to first hear pleadings by Mubarak and his sons, Alaa and Gamal, over the killing of protesters during the 2011 uprising and corruption allegations. But Mubarak was a late-show at the session which will see him defend himself for the first time in his lengthy retrial that began in April 2013. At this point, the judge allowed El-Adly to take the floor to testify in his own defence after the bench accepted a request by the former minister's defence lawyers to allow him to continue the arguments that he started earlier this week, a judicial source told Ahram Online. El-Adly on Wednesday renewed his attack on the 2011 revolution, which started on the 25 of January with the demand of his dismissal before expanding its horizons toward the whole Mubarak regime, claiming it was a "criminal conspiracy" and a US-orchestrated plot, not a spontaneous popular revolution. Speaking in a session aired live on TV, El-Adly said "foreign elements," in collusion with Egyptian Bedouins in the border Sinai region, the Muslim Brotherhood and the Palestinian Islamist group Hamas, stole arms and police uniforms, and killed protesters in a plot to topple the security apparatus. El-Adly also blasted the leading symbols of the 2011 uprising, including pro-democracy advocate Mohamed El-Baradei and one-time prominent activist Wael Ghoneim, accusing them of conspiring against the nation. The former interior minister continued to slam the former vice president El-Baradei, claiming that he considered Egyptians as "donkeys" and had no respect to them because he was "raised among foreigners." El-Adly continued to repeat that 25 January was not a revolution, unlike the 30 June protests. "The 30 June revolution had leadership and goals unlike 25 January which occured to bring down the state, no revolution takes place with the aim of destruction," he said in his long speech. "Field Marshal and president El-Sisi himself said in a television interview that the Egyptian police before 25 January 2011 were ranked third on the world in fighting crime but now its place is 132" El-Adly said. The former interior ministry also sought to absolve himself and security forces of blame for killing protesters. El-Adly, whose security apparatus was infamous for torture and abuse, claimed only teargas and water canons were used to quell protests in January 2011. He claimed there were no recordings or evidence during his meetings with Mubarak or aides of anyone issuing orders ito fire at demonstrators. Although police brutality throughout the Mubarak regime helped to fuel the the 2011 uprising, the former minister insisted on defending police forces. El-Adly also claimed large-scale violence was used by some protesters against security forces, as hundreds of armored vehicles, police stations and courthouses were torched. The former minister however said that not all those who took part in the mass protests were part of the plot. "A large number of the youths who demonstrated were not conspirators and are innocent." Mubarak was set to speak to the court after El-Adly. Alaa and Gamal, who appeared in Wednesday session, are due to give their defence statements later in the day. Mubarak is being retried, alongside his interior minister El-Adly and six of his top aides, for complicity in the killing of around 850 unarmed demonstrators during the 18-day popular revolt in 2011. Mubarak's sons face trial alongside their father on corruption charges. Foggy weather on Wednesday temporarily grounded a helicopter meant to transport the ex-president to the courtroom in a police academy in the eastern outskirts of Cairo, his defence lawyer and a senior security official told the court. Habib El-Adly is the longest serving interior minister in Egyptian history as well as the most controversial, appointed in 1997 and holding the post until the 2011 uprising which deposed president Hosni Mubarak. After joining the police force in 1965, El-Adly worked in different departments and sectors before he became the head of the State Security apparatus in 1995. That same year saw the Luxor terrorist attack in November, where not less than 62 people were killed at one of Egypt's most popular historical and touristic sites. El-Adly was appointed interior minister within 24 hours of the attack. His term was marked by a rise in cases of torture and police abuse against citizens, as documented by human rights organisations. Most notably was the case of Khaled Said, a young man who was beaten to death in Alexandria by two low-ranking police officers and whose tragic ending is now regarded as a direct trigger of the 2011 protests. Ending police corruption – and thus El-Adly's dismissal – was among the main demands of the initial protest organised on 25 January 2011. In May 2011, El-Adly was convicted of corruption and money laundering and sentenced to 12 years in prison. In June 2012, Adly – along with a number of his former aides in the ministry and Mubarak himself – was sentenced to life in prison after he was found guilty of conspiring to kill protesters during the early days of the 25 January revolt. In March 2013, the conviction was overturned and a retrial began in April of that year. January 25 was a heroic revolution, deal with it. This terrorist's opposition to the January 25 revolution was a conspiracy backed by foreign powers. The January 25 revolution was glorious and heroic event, deal with it. Your tyranny had to come to an end. Mubarak's terrorists killed about 900 civilians in January 2011. 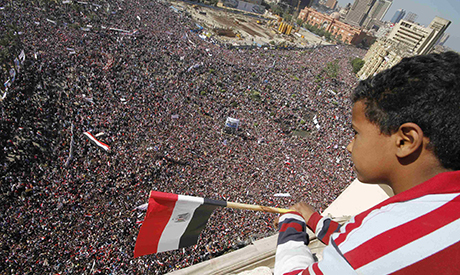 The overwhelming majority of Egypt supported and continues to support the January 25 revolution.